For all those West Coast heads, come out on February 7th at 9:00 to the Knitting Factory (7021 Hollywood Blvd.) 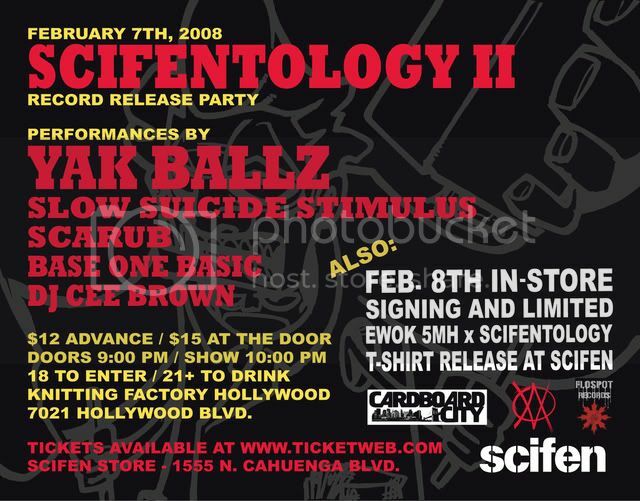 in Hollywood, California for the Scifentology II Record Release Party. The night is stacked with a solid line-up of performances by Yak Ballz, Slow Suicide Stimulus, Scarub, Base One Basic, and DJ Cee Brown. Grab tickets in advance for $12 at ticketweb.com or $15 at the door - 18 to enter/21 to drink. ALSO - The next day, February 8th, there's an in-store signing and Limited Ewok 5mh x Scifentology T-shirt release at the SCIFEN Store, which is located at 1555 N. Cahuenga Blvd. The East Coast record release show the other night was crazy, with great performances from every person on the bill, so you can definitely expect the same on the West Coast! New Video & Scifentology II Drops Today!